The Executive Committee (EC) of the National Mission for Clean Ganga approved 12 projects worth Rs. 929 Crore under the Namami Gange programme in its 16th meeting today. Two Sewage Treatment Plants (STPs) have been sanctioned for Delhi for creating 340 MLD waste treatment capacity at a cost of Rs 580 Crore. The first is an STP of 318 MLD capacity at Coronation Pillar. The second is a project in Chattarpur assembly constituency where various sewage pumping stations and 9 STPs of total 22.5 MLD capacity will be constructed. Sewage flow will be collected and pumped to STPs for treatment. The treated water will be used for development/ rejuvenation of eight nearby waterbodies and for irrigation purpose. The Central Government will fund Rs 256 Crore for the project. For Uttar Pradesh many projects have been approved with total cost of Rs 128 Cr. One existing Common Effluent Treatment Plant (CETP) of 6.25 MLD capacity for textile printing units in Mathura Industrial Area has been taken up for upgradation. Apart from this, one project for treatment of Rampur Drain in Rampur, using NSN-Technology based Bio Oxygenation and another project for treatment of 30 drains and third party inspection of 123 drains in the state has been approved. For inspection and monitoring of industries, STPs and CETPs by third party technical institutions, an amount of 0.98 Cr has been sanctioned for strengthening of UP Pollution Control laboratories. This project will enable UP Pollution Control Board to better monitor and inspect all Grossly Polluting Industries, STP & CETPs situated in the catchment area of River Ganga and its tributaries. For West Bengal, two projects have been sanctioned at a cost of Rs 50 Cr. One project has been approved for upgrading the STP in Kancharapara from 13 MLD to 18 MLD capacity, along with its operation and maintenance for the next 15 years. Another project has been sanctioned for Hilsa fisheries improvement at Farraka barrage. Implementation of this project will increase the natural stock of Hilsa in the river Ganga, upstream of Farakka barrage through ranching of wild collected Hilsa seed/juveniles. The project will also study and monitor Hilsa migration across the Farakka barrage in the main river Ganga. Two more projects have been sanctioned in this EC meeting under CSR category which will be funded by corporate groups. INDORAMA Charitable Trust is funding the Ghat and Crematoria Work at Badrinath and Gangotri in Uttarakhand at a cost of Rs 26.33 Cr. Shipping Corporation of India (SCI) is taking up renovation and beautification of Ganga River Bank at Katwa, West Bengal at a cost of Rs 0.35 Cr. Ramji Tripathi took bottles filled with Ganga water to the offices of the Kanpur Jal Nigam and the Ganga Pollution Control Unit to confirm his strong hunch. Tripathi is a seer and the national coordinator of Kanpur-based Ma Ganga Pradushan Mukti Abhiyan Samiti, an outfit led by Swami Harchetan. When he started sprinkling the “holy water ” on the officials, the police was called and he was forced to leave the premises. Tripathi says he did this only to debunk the claims of officials that river-cleaning operations were yielding results. “Why did they stop me from sprinkling holy water,” he asks. His organisation is now going to launch a movement to boycott bathing in the Ganga in the next Kumbh Mela, which begins on January 15, 2019. After three decades of efforts to clean the national river, it is a sad state of affairs that the river is not even fit for bathing. According to a map of Ganga river water quality presented by the Central Pollution Control Board (CPCB) to National Green Tribunal (NGT) in August 2018, only five out of 70-odd monitoring stations had water that was fit for drinking and seven for bathing (see ‘The filthy stem’,). Initiatives to clean the Ganga began with the Ganga Action Plan I in 1986. Till 2014, over Rs 4,000 crore had been spent. But the river has remained dirty. So when the National Democratic Alliance government launched the Namami Gange in mid-May 2015, there was a new hope. It was the biggest-ever initiative—over Rs 20,000 crore was allotted. Prime Minister Narendra Modi made it his personal agenda and set a deadline: “Ganga will be clean by 2019”, it has now been extended to 2020. 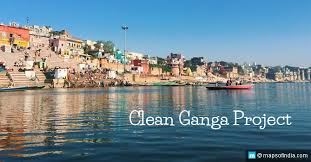 Namami Gange is being implemented by the National Mission for Clean Ganga (NMCG), and its state counterparts—State Programme Management Groups. NMCG would establish field offices wherever necessary. The National Ganga Council (NGC) was created. And to give it utmost importance the Prime Minister was made the head of it. This council replaced the National Ganga River Basin Authority (NGRBA). NGC would have on board the chief ministers of five Ganga basin states—Uttarakhand, Uttar Pradesh (UP), Bihar, Jharkhand and West Bengal—besides several Union ministers and it was supposed to meet once every year. The Water Resources, River Development and Ganga Rejuvenation Ministry signed Memoranda of Understanding (MOUS) with 10 other ministries to synergise the activities under the Namami Gange. The government said it would involve grassroots level institutions such as urban local bodies and panchayati raj institutions to implement the programme. An Empowered Task Force, headed by Union Water Resources Minister, was created and it has on board the chief secretaries of the five Ganga Basin states. It was supposed to meet once in every three months. State Ganga Committees have been formed, which would be the nodal agency to implement the programmes in a state. Besides, these committees would conduct safety audits of the river and take remedial measures. The Centre had also said it would establish a 4-battalion Ganga EcoTask Force to spread awareness about pollution and protecting the river. The government is contemplating a legislation to arrest and fine those found flouting norms. The government also tasked seven Indian Institutes of Technology (IITs) to prepare a report on the best strategies to clean up the river. IITs batted for a Ganga basin approach, which meant not only cleaning the Ganga, but its tributaries as well. The report, Ganga Rejuvenation Basin Management Programme (GRBMP), submitted in March 2015, says that instead of establishing a few projects on the stretch of the Ganga, the whole river basin—that is all the states coming under the main stem of Ganga and its tributaries—must come under the ambit of the programme. The Comptroller and Auditor General of India (CAG), in its report in December last year, said, “The NMCG neither circulated GRBMP to different ministries/departments for consultation and seeking their opinion, nor finalised the GRBMP for initiating the long-term intervention on the Ganga.” The document on NMCG website which talks about the towns under consideration for pollution abatement belong to five states on the main Ganga stem—Uttarakhand, Uttar Pradesh, Bihar, Jharkhand and West Bengal—and not the ones which lie on the tributaries of the Ganga. Cleaning of the Ganga needs a strategy where the NGC has to find effective solutions to the challenges that the previous programmes have failed to address. This would entail addressing untreated waste that flows into the river, restoring the flow of the river, sludge management in Ganga basin towns, cost overruns in execution of projects and governance glitches. 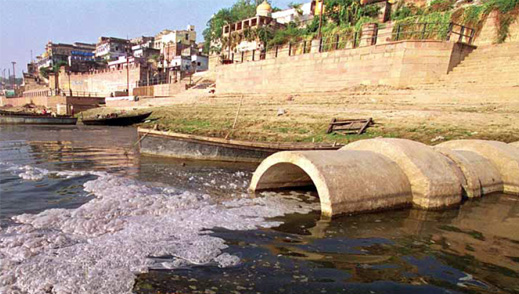 Sewage treatment plants (STPs) have been at the centre of Ganga pollution abatement. As per Namami Gange targets, STPs with over 2,000 million litres a day (MLD) capacity had to be rehabilitated of which only 328 MLD have been done. A look at the status of all the projects undertaken makes one doubt whether the government would even achieve its revised deadline. As far as sewage infrastructure projects are concerned, 68 projects were sanctioned after the Namami Gange was approved by the cabinet and only six were completed till August. Till August 31, 2018 a total of 236 projects, including STPS, had been sanctioned out of which only 63 had been completed. The government has said that the new projects are delayed because land acquisition and other related activities were taking a lot of time. However, poor performance in rehabilitating old STPs does not stand the test of time scarcity. The issue is just not with the construction or rehabilitation of STPs but also their performance. Every STP installed has design parameters for Biological Oxygen Demand (BOD) and Total Suspended Solids (TSS). Consider the STP at Kanpur, which holds the dubious distinction of being home to the “most polluted stretch” of the Ganga. The 5 MLD domestic waste water treatment plant at Jajmau in Kanpur had BOD and TSS level in effluents as 65 mg/litre (against design parameter of 30) and 92 mg/litre (against design parameter of 50), according to the April-May 2018 report of Kanpur Jal Nigam. The report says that BOD and TSS levels of the effluent is higher than the norms because industrial waste and chemicals are illegally mixed with the influents in a plant not meant to treat industrial pollutants. Another problem with STPs is that they are not able to get the total amount of influents, primarily due to lack of sewerage network in the city. A total network of 2,071 km of new sewer line projects was sanctioned after Namami Gange came into being but only 66.85 km has been laid. The STP that treats domestic waste water in Kanpur’s Jajmau has a capacity of 130 MLD but its April-March average was only 60.5 MLD. According to NMCG, all the existing plants in Kanpur have a capacity of 414 MLD but are getting only 230 MLD as influents. For any city, STPs are being designed according to their sewage generation. The problem lies in the way sewage generation is estimated. “The estimation of sewage generation is based on the assumption that 80 per cent of the water supplied is returned as waste water. Some recent data compiled by Central Pollution Control Board (CPCB) shows that actual measured discharge of waste water into Ganga is 6,087 MLD, 123 per cent higher than the estimated discharge of waste water,” says a paper authored by Raghu Dayal in the Economic and Political Weekly in 2016. 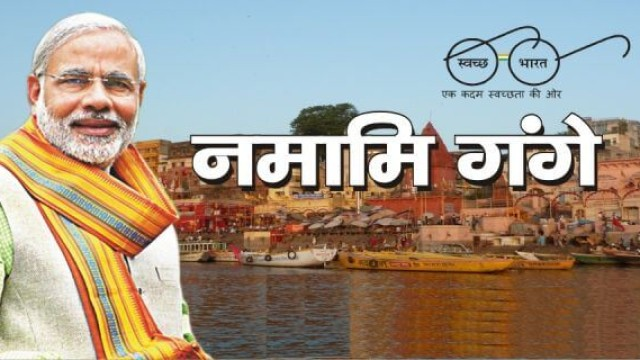 V K Mishra, president of Varanasi’s Sankat Mochan Foundation (SMF), reiterates that the very methodology of calculating sewage generation is faulty. SMF was given the task of constructing an STP of 35 MLD near Assi Ghat at Varanasi in 2010. Mishra, who is also a professor in IIT-BHU, says, “We carried out a three-day schedule for the Assi drain and to our utter surprise we found that the discharge was 63.5 MLD. That was way back in 2010.” Mishra says that when the entire city is not having piped water supply, how can this become the criteria for calculating sewerage generation? Mishra’s argument also finds support in UP State Annual Action Plan (SAAP) 2017-2020, which says the coverage of piped water supply in Varanasi is less than 60 per cent. In Kanpur and Allahabad it is less than 60 and 40 per cent respectively. Kanpur, Allahabad and Varanasi are considered hot spots of Ganga pollution in the entire stem. But domestic sewerage is not the only cause of concern. The industry, especially the tanneries in Kanpur’s Jajmau area have several times attracted the wrath of both the Supreme Court and NGT. The government of UP said to NGT on March 30, 2017 that it has, in principle, taken a decision to shift the tanneries from Jajmau to some other place that is under consideration. However, the government was also open to the idea of installing appropriate anti-pollution devices, including a chromium recovery plant. It is mandatory that tanneries treat chromium either through their own small plant or a made in cluster and then transfer the waste to a Common Effluent Treatment Plant (CETP) run by the government. According to submissions made by the UP government in NGT there are three clusters housing tannery industries—Jajmau, Unnao and Banther. Jajmau has the maximum concentration of 400 tannery industries and NGT wrote in its order, “The industries at Jajmau are discharging much more than 9 MLD industrial effluents, mainly containing chromium. There is no enforcement of consent conditions by Uttar Pradesh Pollution Control Board which requires all industries to send their chrome liquor to the Chrome Recovery Plant and pay for the treatment. Industries are finding it easy to dispose their entire waste, including the chrome liquor, in the common drain which carries both domestic as well as industrial waste.” NGT’s observations find eerie resonance in the April-May 2018 report of Kanpur Jal Nigam. It says that chromium concentration in tannery effluent is 110.2 mg per litre. When Down To Earth (DTE) visited the CETP, chromium had formed a separate layer over the waste water and was visible with naked eyes. Against the design parameter of 175 BOD per 100 ml and TSS 200 mg/litre the effluent had the former at 203 mg/litre and the latter at 253 mg/litre. A visit to Jajmau and nearby villages unveils the reality on the ground. There is no board outside any of the four tanneries right on the bank of Ganga in Wajidpur village and they seem to be running almost anonymously. One can see that they are discharging waste into the Ganga. “Outlet pipes throw dust which we inhale every day,” says Chhotu Nishad, a resident, showing his pierced skin. Hair fall, skin infections, heart and lung problems are common in every family DTE spoke to. Sheikhpur village is located just a few kilometres away from the Jajmau tanneries. Lakshmi Shankar Nishad, a 50-year-old resident, shows his left foot on which skin has almost peeled off. “We are suffering from many more skin infections. This is because tanneries are discharging their waste water directly into drains and the water of drains has mixed with groundwater which has become infected.” Another resident, Sri Krishna says people are becoming impotent in the village and doctors tell them to leave the area. “How can we? Our homes and farms are here,” he says. Not sensing any progress in controlling pollution, NGT in July last year gave more than 100 specific directions related to 86 drains going into the Ganga, Ramganga, Kali and the Pandu rivers. “The government agencies have submitted compliance report regarding most of the directions. But what I gather from the field is that most of the submissions are coloured,” says M C Mehta, who has been fighting cases on the Ganga in the Supreme Court and NGT. B D Tripathi, in-charge of Banaras Hindu University’s Ganga Research Centre, says, “The water level in the river is going down at an unprecedented rate. Also if the flow in the river is maintained it can solve the problem of 60-80 per cent of organic pollutants and we may not require such an elaborate programme.” He also says that unlike other rivers, the Ganga has three special properties because of the path it treads naturally. “The Ganga has medicinal properties that can treat skin infections. These properties come due to medicinal plants on the path of Ganga. Also the Ganga is very rich in minerals and has bacteriophages which kill the bacteria. If you chain the Ganga with barrages and canal diversions and therefore alter its natural path, it will lose these properties.” He says due to restrictions and decrease in flow, the velocity of water decreases and siltation increases and therefore minerals of the water settle down at the riverbed. All these surmises get credence in the paper published by IIT-Kharagpur’s Abhijit Mukherjee and others in August 2018 which says that according to their estimates the baseflow amount of the river has decreased by 56 per cent in 2016 as compared to the 1970s. The decrease in flow has led to an increase in groundwater extraction for various uses. The river has another persitent problem that is going to be more pronounced. “I have a toilet in my home but the two pits under are overflowing with waste. How do I use it?” says Rashid Ali of Chhapri village in Allahabad district. He and his family is back to defecating in the open near the Ganga. Other villagers also narrate similar issues and say the construction of toilets has compounded their problems because the overflowing toilets have also made their homes dirty. The damning indictment is supported by many people living in cities along the banks of the Ganga. A staggering 99.93 per cent villages lying on the banks of Ganga, also known as Ganga Grams, have been declared open defecation free (ODF) by the government under the Swachh Bharat Mission (SBM). As per SBM data, more than 2.7 million toilets have been constructed in over 4,000 villages till September 17, 2018. Not surprisingly, CAG in its December 2017 report casts aspersions on the claim. The report said the state government was to verify the ODF status through its own teams or through a third party but 1,144 villages of UP and Bihar didn’t get it done. The whole objective of making villages lying in the Ganga basin to be ODF was to reduce the faecal coliform levels in the Ganga. Against the standard of 2,500 per 100 ml, the faecal coliform ranged from 2,500 to 2,40,000 per 100 ml in the Ganga basin cities in May 2018, as per data provided by pollution control boards of five states along the Ganga basin. A back-of-the envelope calculation by the Centre for Science and Environment (CSE), a Delhi-based non-profit, showed that about 180 MLD sludge would be generated in five Ganga basin states when they become ODF (see ‘Sludge crisis’,). And if proper faecal sludge management is not in place, it would invariably pollute the Ganga. What should cause further concern is that faecal sludge is a bigger pollutant than sewerage. While the BOD of sewage is 150-300 mg/l, that of faecal sludge would be 15,000-30,000 mg/l. Experts say that while toilets were constructed, hardly a thought was given to management of sludge. According to a study conducted by CSE, most of the cities surveyed had twin-pit technology which is not recommended in low-lying areas. The National Policy on Faecal Sludge and Septage Management (FSSM) 2017 also anticipated the challenge as more and more toilets are constructed. As urban households without toilets obtain facilities under SBM, it is likely that many will acquire on-site arrangements like pit latrines and septic tanks in cities at locations where sewerage systems are not available. Thus, while the containment of human waste will be largely achieved, its safe disposal still poses a huge challenge. A sanitation expert who works with an international non-profit in Delhi says, “There has been no management at all. What was required along with construction of toilets was several interventions to manage sludge, which clearly did not happen.” Even septic tanks don’t seem to be working out due to laxity. An International Water Management Institute (IWMI) paper published in January 2017 after studying three Ganga basin cities—Gangaghat, Mugalsarai and Unnao—says, “Most households (up to 97 per cent in Gangaghat) rely on septic tanks, but these are not properly maintained. Septage is collected every 10-15 years, even though collection every three years is the recommended practice for optimal septic tank performance. The paper highlights another problem. It says that the pollution from the cities flows through a network of small and progressively larger open drains, which eventually flow into the Ganga. None of the three cities has a scheme for management of solid waste, most of which is dumped in the streets, clogging open drains and adding to the pollution load. Only a fraction of this waste is collected by the Nagar Palika Parishads and dumped at the city limits without treatment or recycling. “Officials have come here several times. They go to ghats to survey how the beautification is going on and leave. This drain never catches their attention,” rues Govind Prasad Dikshit, a seer residing in Brahawat ghat near Bithoor. Cleaning up the massive stretch of 2,525 km that the Ganga traverses is a programme where regulating the finances becomes as big an issue as any other. The UP SAAP 2016 says that the Ganga basin towns would require Rs 5,794 crore just for the creation of sewerage networks in the state—more than one-fourth of the entire outlay of Namami Gange. Another catch is with the finances of STPs. Now the government says that the new STPs are being constructed under Hyper Annuity Model under which the developer has to take care of the maintenance of the project for 15 years. As per this model, 40 per cent of the capital cost quoted would be paid on completion of construction while the remaining 60 per cent will be paid over the life of the project as annuities along with operation and maintenance expenses. This payment is linked to the performance of the STPs—the quality of the water treated by it. The report of the IIT consortium had also pitched for a model whereby the service provider receives remuneration for providing “reusable-quality water over a reasonably long contract period”. So are there enough monitoring machines installed to check the quality of the treated water? Highly-placed sources in NMCG say there aren’t. A detailed questionnaire, including one on this was sent to the Director General, NMCG, Rajiv Ranjan Mishra, but it went unanswered. The IIT report predicted the cost of treating sewerage to be about 1 paisa per litre at 2010 price levels. However, the cost would escalate due to the fact that deadlines are not met. Many of the projects sanctioned as early as 2011 could not meet their deadlines even after they came under the ambit of Namami Gange. Sample the case of STPs to be built in Varanasi with the assistance of Japan International Cooperation Agency (JICA). A close look at the development of the project has quite a story to narrate. It was sanctioned on July 14, 2010 at a cost of Rs 496 crore with a deadline for completion in 2017-18, with some parts to be completed in 2016. Documents accessed by DTE reveal that there was absolutely no physical progress of the plant at the end of December 2014, the year in which the Modi government took over, with JICA concurrence for technical bid awaited. The situation was exactly the same by December 2015. STP construction was completed by 34 per cent in December 2016. Then the government issued a revised sanction of the project and pegged the cost at Rs 641.19 crore with a revised deadline of June 2018. That deadline could also not be met and it was revised to October 2018. That is not one odd sample in UP. Bihar has similar cases. A 17 MLD STP was sanctioned in the state’s Begusarai district on March 8, 2010 at a cost of Rs 65 crore. The project is aided by the World Bank. The NMCG documents reveal no progress took place till December 2016, the original deadline. In December 2017, the tender was cancelled. Revised sanction was issued in March 2018 with escalated cost of Rs 230 crore and a deadline of January 2020 and it has now become a project of the Central government. Besides, CAG also pointed out poor financial management for the programme in its December 2017 report. It said, “Only eight to 63 per cent of the funds were utilised during 2014-15 to 2016-17 for the river clean-up programme.” A corpus of Rs 198.14 crore (as of March 31, 2017) was available in the Clean Ganga Fund. 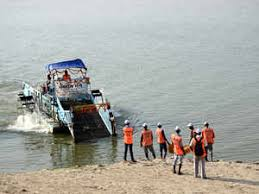 It is a fund under which entities or a commoner can contribute for the Ganga clean up. However, NMCG could not utilise any amount out of the Clean Ganga Fund and the entire amount was lying in banks due to non-finalisation of action plan. NMCG replied (on August 2017) that after its constitution as an authority and its operationalisation by December 2016, the pace of various projects has accelerated. This is likely to result in achievement of not only physical targets but also higher expenditure progress by the end of 2017-2018. However, NMCG documents reveal that till August 31, 2018 though projects worth Rs 22,323 crore have been sanctioned but total funds utilised were only 23 per cent of it. The CAG also came down heavily on Centre for spending injudiciously on media blitzkrieg. As per New Advertisement Policy 18 of Directorate of Advertising and Visual Publicity (DAVP), all Central Government Ministries/Departments/Attached and Sub-ordinate Offices/Field Offices are required to route their advertisements through DAVP only. CAG observed that NMCG hired other advertising agencies for releasing print advertisements in leading national newspapers across the country and incurred an expenditure of Rs 2.46 crore, which include Rs 36.06 lakh and Rs 5.23 lakh as agency commission and service tax. This was in violation of government policy and resulted in avoidable payment, the CAG said. The draft Ganga protection law is with the government but experts question its utility. “It is immaterial whether you come up with a new law or not. What is required is an autonomous body for the rejuvenation of Ganga which is independent of the government when it comes to its functioning. Instead of bureaucrats, it should consist of experts well-versed with the river,” says environmentalist G D Agrawal, the 86-year-old former IIT-Kanpur professor who is on an indefinite fast to save the Ganga from June 22, 2018. The gazette notification by the Ministry of Water Resources, River Development and Ganga Rejuvenation, issued on October 7, 2016 read: “The NGC shall meet at least once every year or more as it may deem necessary.” A senior official in the ministry confirmed to DTE that not a single meeting of NGC has taken place since then. The lone NGRBA meeting chaired by PM Modi took place on July 4, 2016. The Empowered Task Force led by Union minister of water resources has met only thrice after the gazette notification while it was supposed to meet once every three months. It has met twice under the chairmanship of the then minister Uma Bharti and once under Nitin Gadkari, who took the charge of the ministry in September 2017. The mandatory exercise of conducting an annual Ganga safety audit has not been done even once. Almost four years since Modi’s promise of cleaning the Ganga, cities along the river remain highly polluted and data shows that people might be drinking partially-treated sewage. Will Ganga ever be cleaned and is there any deadline possible?